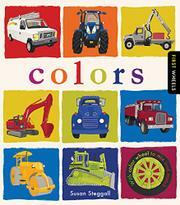 Another contribution to the crowded field of big-truck picture books, with a focus on color. This offering combines an introduction to colors with depictions of a progression of vehicles, two per double-page spread: “red dump truck / red digger // orange digger / orange roller // yellow roller / yellow bulldozer,” and so on through trucks, cement mixers, cars, and vans, coming full circle back to a red dump truck and a red digger. Pink, white, gray, and black join the basic rainbow colors. The vibrant, paper-collaged illustrations are overlaid on plain, brightly colored, contrasting backgrounds; red painted vehicles appear on yellow and blue pages, yellow on tan, purple on yellow. While the images are clear and skillfully constructed, they appear static, belying their intrinsic quality of motion, and resemble a manufacturer’s catalog rather than a children’s picture book. The concept appears to be one of unadorned simplicity. Apart from a smattering of sea gulls, there are no living creatures, and the vehicle cabs look strangely empty. An opportunity to include some interesting, diverse women and men drivers has surely been missed here. Endpapers show a collection of wheels and a repetition of the truck drawings.